Monday morning began easily enough, very early, after a night of terror the likes of which have rarely been seen. Apparently the Wombats were under the impression that it is customary on one's first night in a new country to keep their parents and hosts awake for the majority of the night. 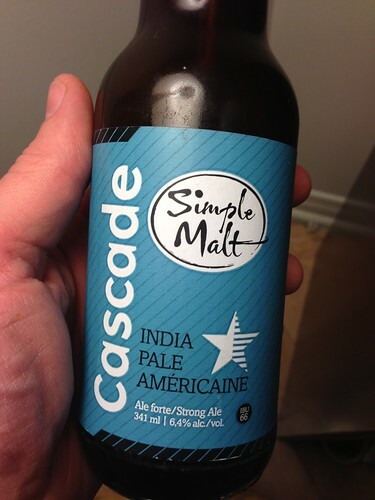 To be sure we asked around and the Quebecois have informed us that this is not, in fact, a local custom. It's remarkable how well we have adapted to only a few hours of sleep and the Wombats had a grand old morning playing with their cousin Jackson and enjoying watching the perpetual snowfall. After breakfast they got their first taste of broccoli which went over far better than we'd expected. Perhaps there is something in the fabulous broccoli of Quebec that makes it extra palatable for babies. This list is getting a little misleading as they have mostly liked everything they have had. I think there needs to be some denotation that there is about a mile gap between carrot and peas. 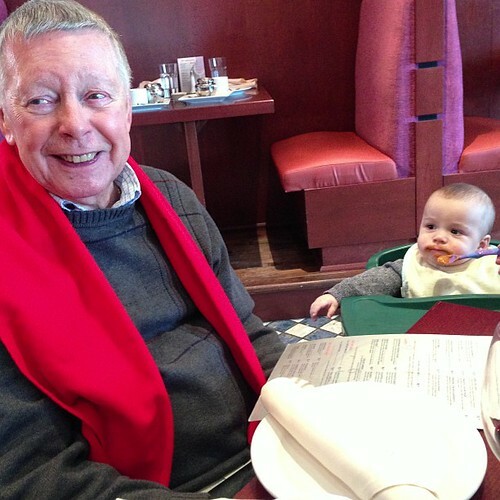 After a prolonged morning/afternoon nap the babies were in great spirits and happy to meet their great grandfather over lunch at a local Italian restaurant. 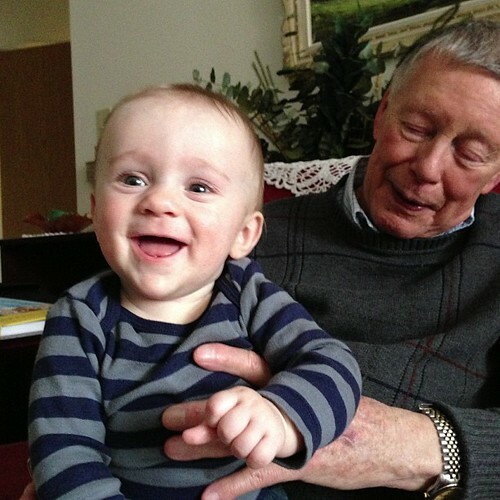 We even went back to Great Grandpa's apartment to hang out, listen to the radio. Elliott fell asleep on his bed but Martin had a great time playing with him while I also passe out in his chair. 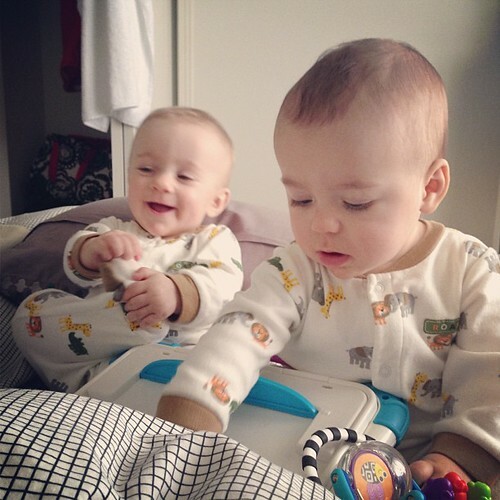 Elliott and I showed our mortal flaws but apparently Martin and Mummy require little-to-no sleep. After a late lunch and a journey back home we met more family and Elliott took quite well to Uncle Jim. 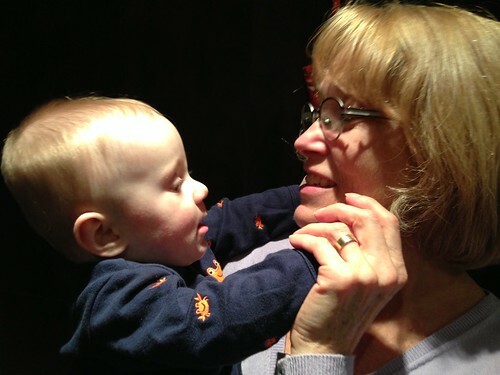 Martin was also taken with Aunt Nancy and closed in to give her a big hug. Just kidding! 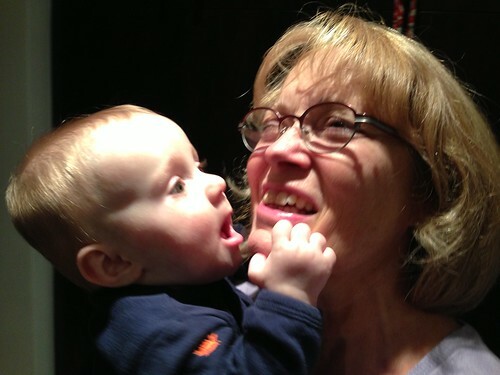 Martin tried to bite Aunt Nancy's face off. Again, this is not a traditional Quebec custom as far as I am aware. I'm beginning to think we need to ask for our money back for the book we purchased before the trip: Baby's First Guide to Quebec Greetings and Face-Slobbering Tradition. 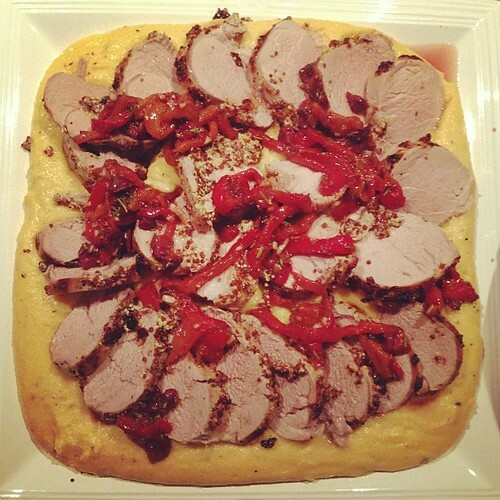 For dinner we roasted up some lovely pork loin and served it over creamy polenta with balsamic roasted red peppers, roasted leeks, and roasted butternut squash purchased at the local market. Everyone at the market was particularly nice except the one French man that clearly hated me and tried to charge me by the pound for peaches in place of butternut squash. Sorry, Dude! You'll have to figure out some other way to scam me out of $20.00. Nice try, Frenchie! For beer we cracked open a few including this Simple Malt IPA Classique and IPA Americaine from Brasseurs Illimites and the IPA from Olde Saratoga Brewing Company which we'd stopped off and picked up on our journey north. They were three very nice and very different styled IPAs. 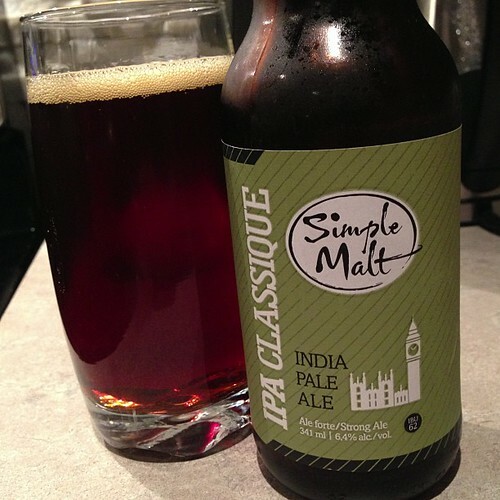 I'd never really had a classic Canadian IPA before so that was pretty exciting. Most things are exciting when you are as dull as I am. Tuesday, we took a trip to the store so Jen could buy a ton of baby clothes. Me and the boys decided to nap in the car. Unfortunately I fell asleep sort of unexpectedly and left the seat warmer on which meant that when they returned from shopping an hour later I was sitting in a car with a dead battery. We tried to get a jump from a local woman who made up a story about how her husband didn't let her give people jumps because one time she melted a car battery (likely story) but ended up having to drive down the street to buy jumper cables and take care of matters ourselves. After that debacle we headed over to Rotisserie St-Hubert whose catchy commercial jingles I have become accustomed to over the years as Jen periodically loves to sing them while doing a silly dance. 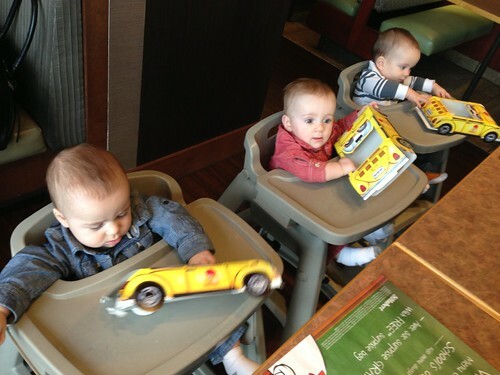 It was some tasty rotisserie chicken as well as a chance to attempt to capture a picture of three babies simultaneously paying attention to the camera while not throwing their St-Hubert cardboard cars to the floor. As you can see from the best picture in the series this was not a smashing success. 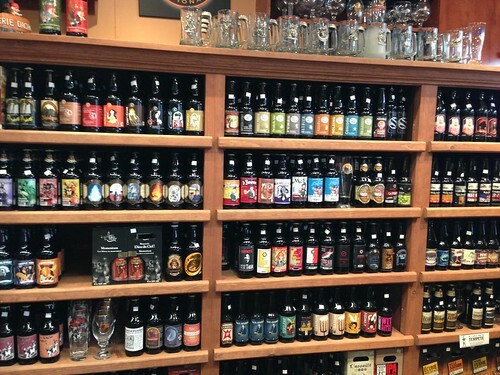 After lunch we headed over to see a tiny beer store with a not-so-tiny selection of beers mostly from Quebec. 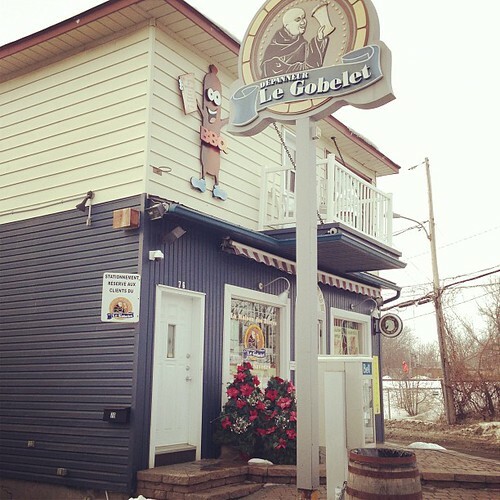 The store was called Le Gobelet and it may be my favorite store in North America, beer or otherwise. They also featured a wide selection of sausages and mustard. 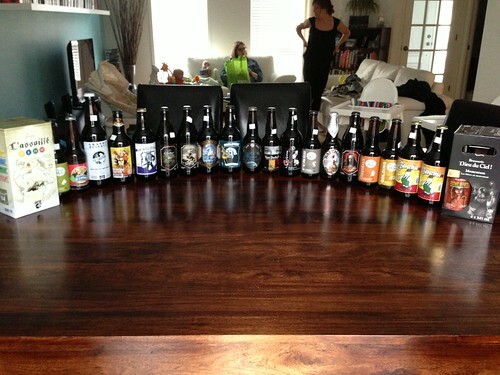 It's great because of the 500 beers they had there I think I'd only had about five of them and maybe heard of an additional ten. With so much new stuff I had to pick up a modest selection. 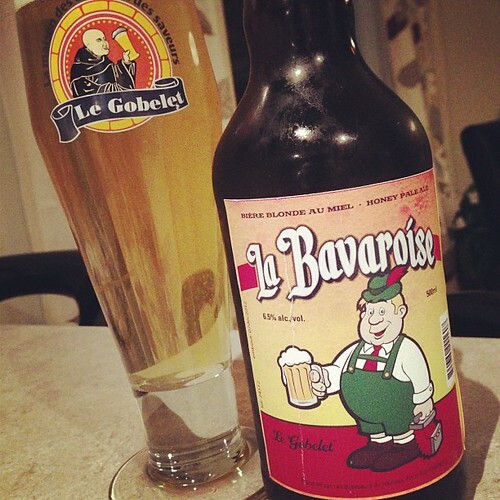 The first beer I tried was this La Bavaroise which was brewed by the owner of Le Gobelet and part of their exclusive line of beers. 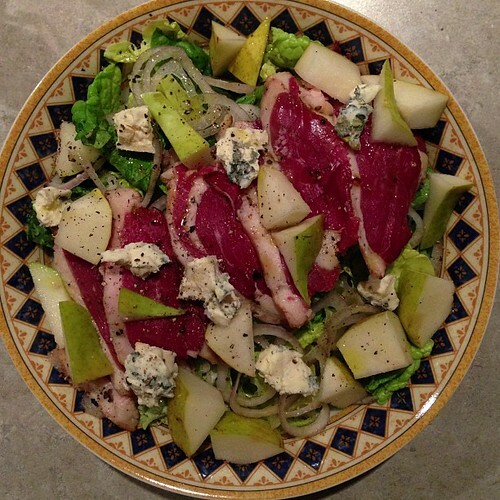 After a trip into town to visit the local butcher shop, and a typical baby-putting-to-bed session I put together a quick salad with smoked duck, shallots, Bleu d'Auvergne, and pears. 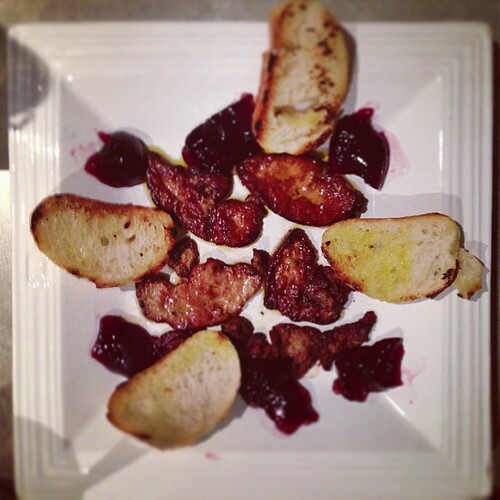 For a second course I made seared goie gras with gelee de cassis and grilled baguette. 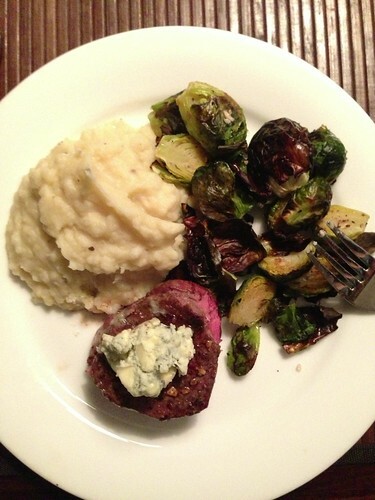 And, finally, a pan seared beef tenderloin with roasted Brussels sprouts, mashed potatoes with foie gras fat added, and Bleu d'Auvergne butter melted on top of the beef. 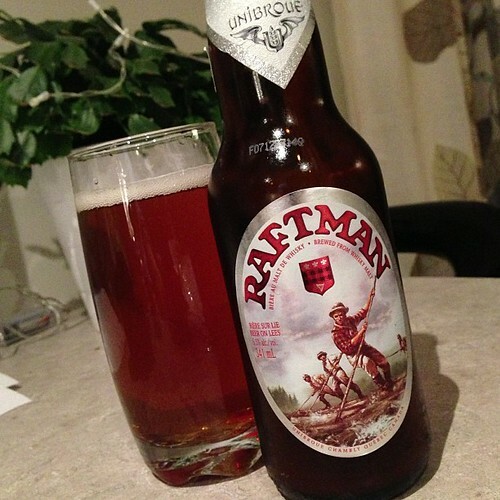 The final piece of the meal was this Raftman from Unibroue, a beer of their I have never seen available in the States. After a mostly restful night of sleep the Wombats were rearing and ready to go nice and early this morning. While we would have appreciated sleeping a little later than 6:30 AM it is still hard to be too upset about waking up to these little goofballs. Goofballs that may have broken our iPad even in its protective Fisher-Price case. St Hubert Chicken - I remember them! We are still waiting for a delivery order that we placed in 1978. We saw a ton of their yellow delivery cars zipping around while we were there. Maybe it's on its way!